Would you like to contribute to the translation of WP RSS Aggregator and its add-ons? We compensate our contributors for their work! WP RSS Aggregator has already been translated into a number of languages and we are always adding new languages to the list. This is a guide for those wishing to contribute a new translation. You’ll need some specific tools to prepare translation files for WP RSS Aggregator and it’s add-ons. If you’re experienced with translating WordPress plugins, you likely already have the necessary tools installed. If you aren’t you should download and install a translation tool like Poedit. This document will walk you through creating translations using Poedit. Translations are created by building off a POT file. The POT file is used by translation tools and contains all the strings that need to be translated. In WP RSS Aggregator and its plugins, the file is stored in the languages directory. Existing translations are located in the same directory and listed with their language’s individual PO and MO files. Open the wprss.pot or the [language].po file for the add-on you’re translating. Select the language you’ll be translating into from the box that appears (when using a .po file, the language is selected automatically for you). Poedit should then load and display the strings. 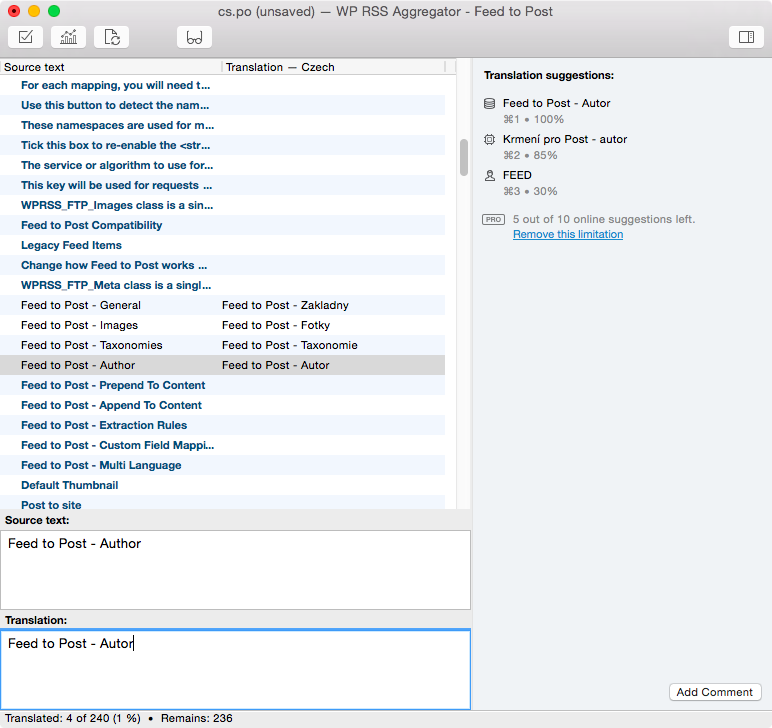 The following image shows Poedit after starting a new Czech language translation for the Feed to Post add-on. The screen is divided into two columns showing the source text (in English) and the translated strings. Also note that the correct filename (visible in the title bar) for that language is generated by Poedit. The Source text and Translation text areas on the bottom of the screen will be updated when a new row and string are selected. 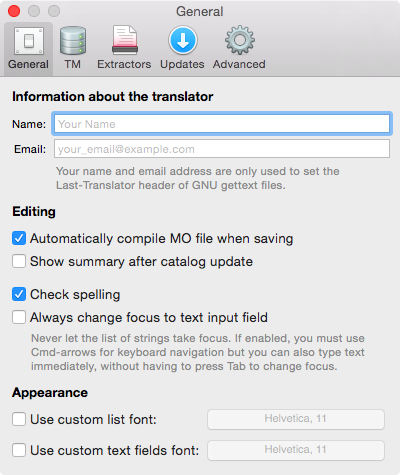 Enter your translation in the Translation text area and press Cmd+Enter or Ctrl+Enter to save and move to the next string. After you translate all the strings, click the Validate button (the left-most button in the toolbar) to ensure all translations are valid. Once there are no problems, you’re ready to save the PO file that will contain your translation. The file created when saving a translation in Poedit is another .po file. This is the file that Poedit reads and modifies as you edit your translation. This is also the file we require you to send to us. However, WordPress uses a compressed version of the .po file, which has a .mo extension. When you’re finished with your translation, ensure the Automatically compile MO file when saving checkbox is set in the Poedit Preferences panel. While you’re there, make sure to fill out the Name and Email fields with your information. 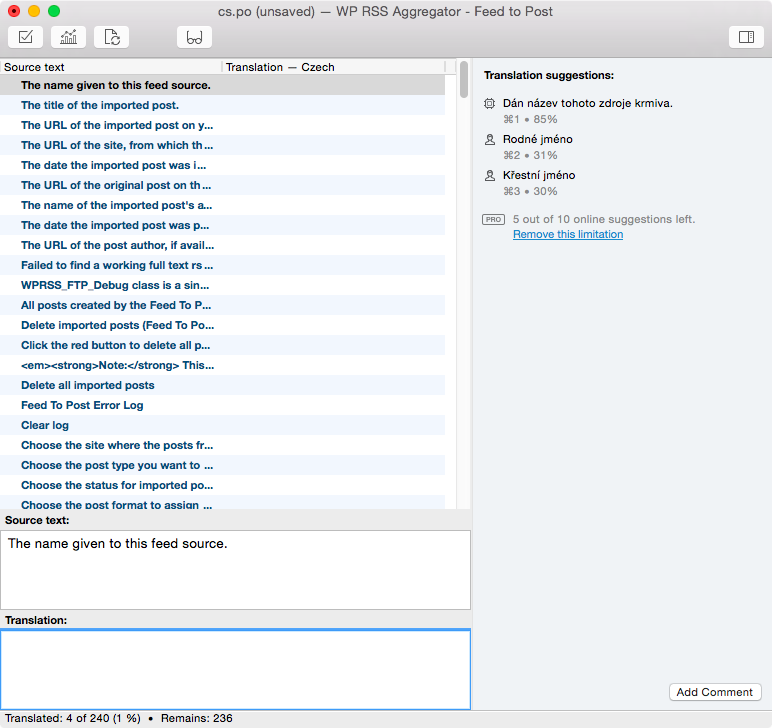 Save your translation and send the .po file to the WP RSS Aggregator team. You can send it via email if you are already in touch with us, or via the submissions form below if you have not yet contacted us. Please upload the .po file here.